You’ve been struggling with some discomfort when eating recently. Hot and cold foods and drinks cause a twinge in your tooth when you eat. Sweet foods and drinks have the same effect. You may have even noticed this slight ache when chewing. What does this mean? 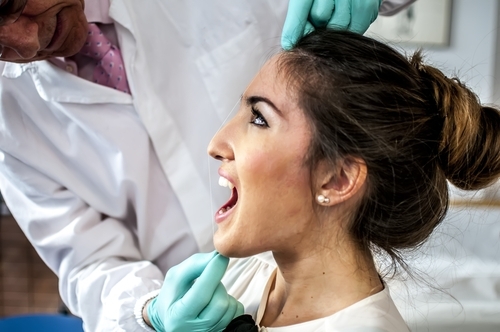 You may wonder if you have a cavity, but how can you know for sure? The one sure way to detect a cavity and to stop it in its tracks is to go to your dentist so they can diagnose and treat the decay. It may come as a surprise to you that your dentist can detect tooth decay before any symptoms are noticeable. The best way to catch early cavities is to go to your dentist’s office at least twice a year for a professional cleaning and exam. How Does the Dentist Spot Cavities? When you visit your dentist, they will examine your teeth and probe them with a special tool. This aids in the detection of pits or damage in the teeth. Another helpful decay-detecting method involves a special liquid stain. This nontoxic dye is brushed over the teeth and then rinsed off with water. The stain rinses easily from healthy tooth structure, but sticks to decayed areas. Depending on your oral health and your risk for decay, your dentist will set a schedule for taking X-rays of your teeth. These X-rays can help your dental professional spot any decay that is not easily spotted with the naked eye. If you are hesitant about a diagnosis or treatment plan you’ve gotten recently, come to Exceptional Dentistry! Dr. James Powell and our team are more than happy to give you a second opinion. We have the skills and technology needed to give you an accurate diagnosis. In addition, we will make sure that you understand each of your treatment options. We want you to be able to make an educated decision for your smile or for the smile of your child. We encourage you to contact our dental office in Palmdale, California, today to learn more about cavities or to schedule your next reservation. Our dentist and team are dedicated to helping safeguard the health of your smile!